INTROVABILE: SISTEMA MACROSPEED PER ESEGUIRE FOTO IN MACRO UTILIZZANDO CARTA SX-70. SEGNALIAMO CHE: IL CASSETTO DI SINISTRA E' STATO INCOLLATO SUL FRONTALINO, NON ABBIAMO PROVATO A FARE DELLE MACRO PERCHE' NON CONOSCIAMO IL FUNZIONAMENTO DELLO STRUMENTO, COLLEGATO ALLA 220V SI ACCENDONO TUTTE LE SPIE E SE SI DA IL CONSENSO LA MACCHINA DOPO UN CERTO TEMPO PROGRAMMABILE EMETTE LA FOTOGRAFIA (CHE RIMANE MARRONE PERCHE' SICURAMENTE LA CARTA E' INVECCHIATA, MA NON NON SAPPIAMO NEMMENO COME E DOVE SI METTA LA CARTA), E' PRESENTE ALL'INTERNO DEI CASSETTI DELLE MASCHERE E DEGLI SFONDI COLORATI ED UN FUSIBILE DI RICAMBIO, ALL'ESTERNO LA CASSA GRIGIA E' IN BUONO STATO, QUALCHE SEGNO SPARSO ED UN PAIO DI ABRASIONI DOVUTI AL TEMPO, MISURA 43 X 23 X 20 CM CIRCA, TUTTO COME DA FOTOGRAFIE DETTAGLIATE. 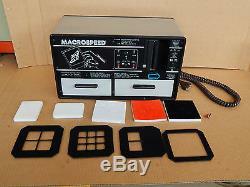 The item "POLAROID SISTEMA MACROSPEED CARTA SX-70 RARE PER FOTO MACRO" is in sale since Tuesday, March 15, 2016. This item is in the category "Fotografia e video\Vintage\Fotocamere vintage\Fotocamere Istantanee". The seller is "markluk" and is located in Santena. This item can be shipped worldwide.